On Tuesday, May 25th, The Leader’s Institute ® arrived at Philips Lighting in Somerset, New Jersey to deliver a fun sales team building event. Philips Lighting is a global market leader with recognized expertise in the development, manufacturing & application of innovative (LED) lighting solutions. Executive Assistant, Linda Perricone sought a fun team building activity that also gives back to the community, and The Leader’s Institute delivered! The teams were comprised of 10 Vice Presidents from across the country, all sales professionals. Bill Schoettler. Senior Vice President, Head of Professional Sales – Northeast gave facilitator Michelle Riklan carte blanche to do whatever was needed to get this group ready for an exciting, impactful event. Immediately she engaged the team with icebreakers (with a few twists thrown in) that amassed enthusiasm, positive energy, and complete participation. The 10 Vice Presidents had an opportunity to get to know each other better while exercising some of their leadership muscles. Sales Team Building is Fun! Sales team building (team building events for sales teams) can be really fun and energetic, and this one certainly was! Without knowing what was in store for them during this event, the group was quite curious about the empty bicycle boxes and scattered bicycle parts. 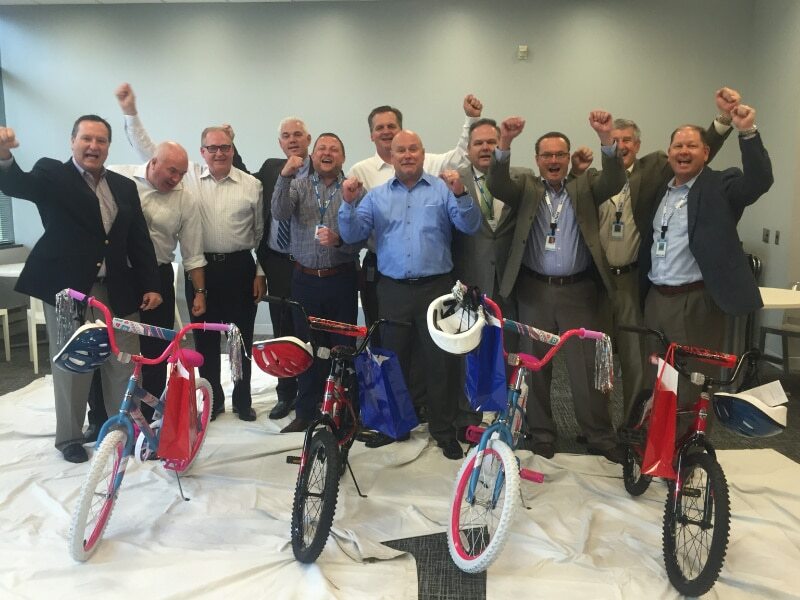 They were armed and ready to “earn” their parts and build their bicycles. The group found the building component to be much easier than the earning activity! Earning the parts was challenging, but at the end of the event, we had four well assembled and safety checked bicycles; the group was very proud of their efforts. Denise Cook, Case Worker from Big Brothers Big Sisters arrived at the end of the event to share information with all about their programs and how their efforts would benefit children in need. The group applauded Denise and were clearly thrilled to be giving back to a worthy organization. They were more thrilled when children arrived to accept them! We had two families arrive, each with brother/sister siblings and the look on the children’s faces was priceless. If you have a sales team and want to add some energy to your next meeting, have us come out and conduct a sales team meeting for you, too! Call us at (800) 872-7830 for details.